Since last night after work was pretty nice for the temperature outside, amidst all the misty rain, I went for a 2.5 mile run on the bike trail. All in all it took me close to 22 minutes to do. I know I've ran faster, but I'll get back to that point once I'm running more consistently. This morning was a 10 minute HWR session, done kettlebell style with squats, lunges, presses, cleans, and swings to finish. This was about the right length, since I was sore from the KB clean workout and the run yesterday. We'll see how I feel for an evening session, depending on the weather. Over the past month or so, I've been getting used to a lot of kettlebell cleans for high volume reps, in sets of 20 to 40 reps, sometimes more. I bought a set of KettleShields, which are a set of wristbands with a hard shield inside of them for some protection of your forearms when you do kettlebell workouts. I can tell you that the KettleShields make a difference when doing high rep workouts. such as 10 at a time per side. It saves on the slight beating your forearms can take and also gives you a little cushion there to absorb some shock. A common work/rest pattern I'll use with 1 arm cleans is 10 per side, for 40 reps total, which takes me about 1:40 in time to do. I'll rest 1:20, almost a 1:1 work/rest pattern, and basically do a set of 40 every 3 minutes. This keeps a workout on time and simulates interval workouts of longer duration, such as a track interval routine. 1:40 may take you enough time to get 400m completed on a track in a hard effort for a lot of people. Resting 1:20 gives you some time to recover, then hit another one again. Since I don't have a track nearby during the winter, this is as close as I can get to creating a similar level of effort over that time. Today's workout was doing 40 every 3 minutes, 10 per side x 2, up to 18 minutes. That gave me 240 reps total, so I finished it off when 18 minutes hit, and did 5 per side for up to 60 reps, accumulating 300 total reps in the workout for the day in about 20:30 of total time. As January ends and February begins, I am planning to do more heavy kettlebell cleans with my 53# bell and perhaps build up to some longer interval workouts. If weather gets nicer out, I also plan to do some more outdoor running. I'm also trying to start a track club at the college I work at, and if we get enough students out for it, I may do some sprint training with them for something different to add to the mix. Want to add some Spark to your workouts? Become a Preferred Customer with AdvoCare and get a sample box of Spark packets as a gift with your membership. Register today at this page! Yesterday, after a long string of days with workouts, over 20 of them, I decided it might be time for a day off. (You'd think!) It did feel good to rest up and recover over a day. This morning was a good temp outside to try a morning run out on the bike trail in town. The rest of the streets in town are pretty iced up and slippery, so I'm glad I drove out to the school, parked the car and went out on the trail. Ended up going for about 8:25, 8:30 a mile for 3 miles in all. After the run, I had a nice change of pace for breakfast, I made some egg & oatmeal pancakes. I blended 3 large eggs and 3/4 of a cup of oatmeal together, and made pancakes out of that. Regular pancakes are great, but over the course of the last few years, I've noticed how much gluten can affect me. I still have breads now and then, but try to keep it very limited. I don't go super gluten-free, but gluten-less and less intake of carbohydrates overall. I'll still have a sub, or a burger, or pizza now and then and be a little affected, but like I said, it will keep it limited and help lessen the effect. I'm still taking my MNS-E packs each day and if you have an interest, I'm still doing the 14 Day Mini-Challenge that starts on February 6th. Save even more on the challenge if you become a Preferred Customer, or go a step up and become an independent distributor like I am. Both offer great savings to start (20%) and the opportunity to save higher percentages over time. Find out more at http://tinyurl.com/asapadvo and ask me if you have questions, hit me up with a message on Facebook or the ASAP Workouts page. Today's workout was a lighter kettlebell one, keeping it short and lighter than usual. I used the 40# kettlebell and did 100 straight cleans, alternating every 10 per side. This took 4 minutes to do. I rested for 2 minutes, then completed 50 clean and presses, doing 5 per arm throughout that time frame. That also took another 4 minutes to do. I looked at my training plans and I've done 20 straight days of doing something each day. A 10 minute routine was perfect to be light enough and short enough to end that kind of stretch on. Yesterday, I just added a new free report called The Top 5 Fitness Products You Really, Really Need At Home. You can grab your free copy here to see the essentials of what I think someone needs to get the basics in. Take a look at that report and see a few honorable mentions and some suggested additional stuff (because 5 is pretty limited if you seriously get into it). Day 24 is complete, Day 25 is basically my continuation of kettlebell and HWR routines. I went with a KB clean workout for 240 reps total in under 18 minutes, using the 53# kettlebell once again. Overall it is a good start and drop in body fat that I was aiming for. I feel I can tweak the diet better now and eliminate more of my evening snacks, which kind of plagued me from the start and through the middle of this challenge. I'm going to be in a maintenance mode and continue with the MNS packs and Spark. I know I'm starting a 14 Day Mini-Challenge on Feb 6th, but I'm going to stick with what is working for me through that time frame. I'll be sticking with the MNS packs for quite a while now. The 14 Day Mini-Challenge is great for new customers who are new to AdvoCare and want to give it a trial run with the MNS series. It's still a great time to become a Preferred Customer, or even a Distributor with AdvoCare. Take a solid look here at http://tinyurl.com/asapadvo on my personal site for it. PC memberships start at $19.95. Distributor start-up packages are only $59. PC's save 20% and can build up to 30%. Distributors save 20% initially and can build towards 40% off retail when you attain the Advisor level with your sales. I know AdvoCare is a great part-time business for me to run, on my own schedule, and I have a 24/7 site available for my customers to order at any time. Consider getting into the opportunity if you want to help others with their health and fitness goals. Today is the final day of the 24 Day Challenge that I'm on. I went with 2 rounds of Home Workout Revolution: a 10 minute circuit, then a final 4 minute circuit that was pretty steady throughout. It was 2 minutes of 20/10 x 4 on each exercise. So far, this morning's measurements has me down by 5 pounds and 1.3% body fat reduction too. It's a really good beginning to the month and for my goals. Tomorrow will be the true 24 day measurements. I'm starting up a 14 Day Mini-Challenge of using MNS and Spark, or just the MNS series for 14 days if you'd like to just do that. It isn't quite as encompassing of the 24 Day Challenge, and this is sort of my very own mini-version of it. It is a great time to try it as well, since you can become a Preferred Customer of AdvoCare for a $19.95 membership that gets you 20% off with incentive to get up to 30% off over the course of time with your increasing orders. You not only get the savings, but you will get an Impact magazine, Product Navigator, Product Catalog and also a box of Spark samples. Along with your 20% savings, you can then order the MNS series and try the 14 Day Mini-Challenge that I have coming up on Feb 6th. You have some time to order this and have it all set before February 6th. The Mini-Challenge will be held through my ASAP Workouts Facebook page, so join that today as well and be ready for it! It is really getting down to the end here, 2 more days to go with the 24 Day Challenge. Today was another kettlebell routine with KB cleans with the 53# kettlebell. I did rounds of 40 reps, 10 per side, every 3 minutes up to 18 minutes. At that point, I had 240 in, with 60 to go before 300 was hit. So, at the 18 minute mark, I did a set of 60 to finish it at 300 reps total, and about 20:30 for total time. After doing hundreds of KB cleans, I'm glad that I now have the KettleShield wristbands. They are a huge forearm saver with that many reps to do over time. Last night, I did another video at my ASAP Workouts page and chatted about the 24 Day Challenge so far, plus some more about becoming a Preferred Customer with it. Interested in being a Preferred Customer, and doing a mini-challenge? Think about this: Become a PC and you'll get a free sample package of Spark. Then, order a box of the MNS series. You'll save 20% on your MNS order, plus have both the MNS and Spark to try for 2 weeks. Now is a great time to order this and all in all, it will be around $65 to order both. Keep in mind, you'll also get the Impact magazine, Product Navigator tool, and a Product Catalog for quick reference on all AdvoCare products. If you just want the PC membership, you'll get the Spark sample package, Impact magazine, Product Navigator, and Product Catalog as a part of your membership for only $19.95. Consider it today and join now to make a difference in your health and fitness goals at right here. This morning's routine was a nice blend of the 12 minute HWR pattern, done in kettlebell style. The first 4 minutes were 1 arm swings, alternating every swing. This gets 12 swings done in 20 seconds. 8 rounds of that is 96 swings total. For the final 4 minute round, I went with clean & press, doing 5 per 20 second set. This ends up with 40 reps total. I like doing this as a nice build-up workout. The swings get you tuned up, the cleans offer a little more total body effort, while clean & presses offer a little more effort. I used the 40# kettlebell throughout the whole routine. All in all, it was a great upgrade to the typical HWR workouts. It is the final 3 days of the 24 Day Challenge. Have you thought about doing your own yet? Take a look at the entire program here at my 24 Day Challenge page. Today was a slushy 6 mile ride on the fat bike through the streets and trails of Mayville and Portland. The bike trail was recently cleared off, making it a nice ride overall once I got out to it. Most of the streets are pretty slushy in town, the trail was pretty cleared off with puddles here and there. As today is Day 21, I have just Monday, Tuesday and Wednesday left in the 24 Day Challenge. I feel the Max Phase has gone the best for me, and I really like how the MNS packs fit in well with my day. I thought it would be a lot, but really, I'm done taking them after lunch and it works pretty well overall. I'll continue on with the MNS packs and some Spark and begin that 2 week phase next Monday. I will take a little break from things after the 24DC ends after Wednesday. I'll still maintain things with some protein shakes I make to go with my overall plan. As my diet is tweaked, I like having a regular protein shake mixed with juice for breakfast, maybe some fruit to go with it, and a regular meal at lunch. I then have an AdvoCare shake in the evenings and try to keep my snacking limited. I won't lie, snacking has been a challenge for me this winter. Chips and homemade salsa have been an obstacle. If you have thought about the 24 Day Challenge, I suggest trying at least a 14 day period of using the MNS packs and also Spark. If you enjoy morning workouts, try Spark before it and then start your day with the MNS packs. It is a pretty affordable route to try it, and if you're a Preferred Customer, it is only about $66 with your 20% savings as a PC. Think of becoming a PC today, its a great first step and every new Preferred Customer gets a sample box of Spark to go with your membership! So, for only $19.95, you can get your membership to start saving money on future orders, plus get a package of Spark to spark your plan with AdvoCare! This morning I decided for a morning run out on the slushy and slick streets. My usual time of course was slowed down from an 8 minute mile to about a 10 minute mile pace. The strides were small and footing was more important than speed today. Overall the run felt really great for a change and the slower pace due to the road conditions actually helped me enjoy the warmer temps some more. Last weekend we were just coming off a big cold spell of dipping to even -20 on Friday, now we are at 33-35 degrees. Quite a change in temps, so it was nice to finally get outside and enjoy it. Not sure I'd run again because the streets were pretty slick in a lot of spots. I felt pretty lucky that I didn't slip out there. I'm getting down to the last 4 days and will be completing the 24 Day Challenge very soon. I'm feeling a lot better the past week since the Max Phase began. Here is to finishing out a strong 4 days of the challenge. This morning, I went with another round of Home Workout Revolution for a 12 minute workout. For the weekend, I'm thinking some more fat biking is in order because of the weather forecast. I thought about going last night, but my driveway needed some care to try and get some ice off of it. We got hit with a nice coat of ice over Christmas and it hasn't really been that warm out (actually really cold for a while) to cut through it. Now that we're in the 30's for temps, the weather is helping to get things back to normal. This little heat wave up here (for January anyway) is making it nice for some outdoor workouts. Since I'm in Day 19, things are winding down for the 24 Day Challenge. I'm already planning for Day 25+. I just got my order of MNS and Spark yesterday to continue onward with it. I'm already starting to see how the MNS packs can really become the core or center of your program, and other products can go around the wheel of it. I'll continue to take Spark and MNS-E, plus continue on with my OmegaPlex bottle too. The MNS packs really help save you from finding a lot of products individually. Instead of searching for a probiotic, a thermogenic aid, a vitamin-mineral combo, plus fish oil could cost you a lot with individual bottles alone. MNS packs put all of those into a daily strip and you just take them at certain times. I know it works great for me compared to other challenges I've done. The work is already done for you in separating and timing all those types of supplements. I feel the MNS packs will be a mainstay in my supplementation from now on. Heading into the last week of the 24 Day Challenge, things are going well. I opted for KB Swings as my workout today, since my shoulders and upper body were a bit shot after cleaning off my roof last night. I used the 53# kettlebell, doing 100 swings every 4 minutes and getting 400 total in for the workout in right around 15 minutes. 100 swings takes me about 2:45 of time, so I rested 1:15 in-between sets. This workout felt a lot less taxing than my usual kettlebell cleans workout, and was a nice change of pace. On Saturday, I'll hit up the cleans again. My diet was a little different on Wednesday. I usually do a shake in the mornings, a light lunch, and a light dinner. I went with a light breakfast of fruit and nuts, a somewhat heavier lunch at the cafeteria, then a shake after my 'workout' with the roof. I was busy with some other stuff later on, so that kept me away from the cupboards. I was surprised how well the shake filled me up for the night. My AdvoCare order should be coming today. I ordered some more MNS packs and also another package of Spark. You can also order some products and save even more by signing up as a Preferred Customer, simply sign up for the package at the low $19.95 cost and start saving with your orders! My original plans for the 24 Day Challenge were to do all 4 workouts of The Achievable Body, every other day, for 12 workouts total. 3 rounds of those 4 workouts. I've done 2 workouts of each one, and I felt I needed to return to HWR for the last 4 strength circuit days. It was a combo of the 12 minute HWR workout, then the 4 minute interval one that had jumping jacks, burpees, running in place, and total body extensions for 1 minute each in the 20/10 work/rest fashion. I felt my body just needed something where I wasn't swinging a kettlebell around or lifting a lot of reps with dumbbells. I've only had one true day of rest the past 16 days, so it was time to break it up a little with just bodyweight stuff today. Overall, I'm still around 205 for weight and looking to drop that a bit more the last week here of workouts. I've already ordered my MNS pack for another 2 week stretch to do in February. I also added in a package of Spark to go with it. It is also a great time to be a Preferred Customer, as you'll save 20 to 30% off (more savings with more orders over time). Becoming a Distributor can get you even more savings, working up to 40% off (as I'm working towards). Being a Distributor can also allow you to sell products on a retail basis, while PC's do not have this capability. I also like being a Distributor because I can make sales 24/7 through my site and to me, that's a nice option to have to earn money while you're sleeping or during a busy week or weekend. My first sales on AdvoCare happened over a busy weekend, that was a nice thing to discover that I had something working for me, in the background, during my free time. Think about being a PC today, or look at being a Distributor as well. Check it all out at http://tinyurl.com/asapadvo. Yesterday was another nice one out and with the day off from work, I had a nice ride in the afternoon on the fat bike, going for a 5 mile ride overall. Temps were in the low 20's and it wasn't that windy either. Today called for another kettlebell ballistics day, doing 200 reps total in 15 minutes of time. I did 40 every 3 minutes to get my 200 in 5 rounds total. Tonight I may try to run at the gym, or hop on the fat bike after work and get in a quick ride before the sun goes down too much. 8 more days to go in the 24 Day Challenge now, 2/3's of the way through it. After 5 days now of the Max phase, I really like how the MNS packs work together. The ease of using them in timed packs throughout the day (mainly morning and lunch) makes it so much simpler than buying 3-4 separate bottles of products and taking them. I'm also liking how the shakes work great as my breakfast option. I also tried it at lunch time and I don't mind varying that up a bit. The shake at lunch helps fill me up in the afternoon, but I like how the shake does the same with me in the morning and gives me a nice boost. Yesterday, the weather was finally decent enough to dress up comfortably and enjoy a nice bike ride on the Fat Bike. I ended up aiming for 3 miles at the pace I was going (roughly 10 miles/hour), but as I continued, I felt good enough for a bit more than that. I ended up doing 4.5 miles in about 28 minutes of time. This morning I slept in with the day off, and hit up Workout D from The Achievable Body. It's another 16 minute effort of a mix of exercises for 6 reps each. I got each round of exercises done in roughly 2 minutes/round, so I ended it with 8 rounds total in the end. 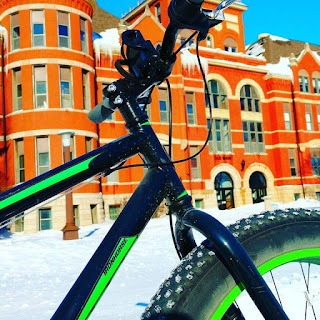 Today might be nice enough again for another fat bike ride outside. We're talking temps in the 20's by the afternoon and a good warm stretch coming this week. The fat bike may be heavy and slow, but it sure is a fun ride to do during the winter months. Even though you're going slower than usual, the heavier nature of the bike takes almost as much effort to move. This feels like you're getting in the same kind of workout as you would during the summer in much faster, warmer conditions. The diet continues to go well and I've pretty much replaced my usual breakfast meal with the replacement shake from AdvoCare. I'm surprised how much it fills me up. Take a look at the meal replacement shakes here at http://tinyurl.com/asapadvo . This morning called for another session of kettlebell cleans, and I decided to spread it out over time for this one. Instead of condensing high reps in a smaller amount of time, I went with 20 reps (10/side) every 2 minutes, doing it up to 40 minutes. 20 sets of 20 reps is 400 reps total. The work/rest ratio on this was roughly 50 seconds work, 70 seconds rest on each cycle. The diet on Day 13 went well, I kept it pretty easy throughout the day, but the evening was filled with a 'reward' meal of the Comet burger and fries. The Comet burger is a pretty loaded bacon cheeseburger it has been a very long time since my last one I've had. let that be my last meal of the day and only snacked on a piece of beef jerky later on in the evening. I sipped on some Spark during my workout this morning and will drink a shake in a short while. I'm also planning to go for a bike ride outside later on my fat bike, since the weather will be pretty decent for that. I've been itching to get out there on my bike, since the weather has been horribly cold and not very safe to even be out in. Overall, I have 10 days to go and I'm feeling pretty good about this challenge. It is getting to be crunch time here and my body is feeling a lot better, now that I'm two weeks into this. I'm starting Day 13 today and it began with Workout C from The Achievable Body. I've noticed the MNS packs are making a nice difference for me, as far as energy level goes and appetite control. I've also noticed taking the shake for breakfast is pretty filling for me. I keep lunch somewhat light and dinner as well. I think the MNS packs are helping with appetite control, as I'm not feeling so hungry in the afternoons or in the evening. Recently, I got some books that were on sale, on sale for really, really cheap: only $1 each. I thought I'd pick them up at that price and do some reviews of them on the blog. Look for some reviews as I go through the books and give my thoughts. I also have some other ones that I bought this past fall that I've been meaning to go through as well. Those should also be a great thing to review in the future. If you've thought any more about AdvoCare, its a great time to become a Preferred Customer and get 20% off your orders, with incentive to get up to 30% off over time with your orders. Not many companies will give you a deal and then increase that deal even more over the course of time as you order products from them. It's another reason why I like selling AdvoCare products, compared to others out there. Take a look at becoming a PC today right here. You could become a PC today and save 20% off your MNS, Spark, or Meal Replacement Shakes you can order easily through http://tinyurl.com/asapadvo . I got an early start to my day, as I woke up an hour earlier than normal and since I couldn't fall back asleep, I went ahead with my workout. I had planned another day of kettlebell cleans, doing my usual 240 with 40 done every 3 minutes. However, I wanted to end the week on a physical challenge: See if I could do 100 straight. I switched every 5 reps per arm, for 20 sets total, getting my first 100 done in 4:30. I rested until 7 minutes, and decided to try another 'long distance' run of however many I could do. I started with 10 reps per side, got to 80 and drove through to 100 total, surprising myself in the process. I rested until the 14 minute mark and went after it again. This time I finished with 60 reps, resting until the 18 minute mark, and finishing with 40 reps to get 300 total in under 20 minutes. This was surprising to me, and also exciting to get that amount of volume in that total time. A great way to finish the week and also hit my halfway point in the 24DC. As a part of a fun thing to do this weekend, I decided to give away two of my Kindle guides: Just Swing It, and Just The Workouts, through Amazon's promotional tools. "Just Swing It!" covers my 24,000 kettlebell swing journey that started with a 10,000 swing challenge done in January. "Just The Workouts" is a dual guide of my "KettleBolics" program and "Indestructible!" workout plan. "Indy", as I like to call it, is based on the one program that was a constant throughout HS and college years that showed up in literally every weight room that I was in. It always seemed to be tucked away in the corners and by the benches or squat racks, complete with a chart of the weight to do for every set and number of reps. I've affectionately called it 'The Program That Never Left The Weight Room". From today through Sunday, you can get JSI and JTW for free on your Kindle readers & apps. If you happen to like Just The Workouts, you can buy the companion guide, Just The Chart, to go with it. Just The Chart pairs up well by giving you the exact poundage for every set/rep based on maximums. JTC is a bargain at only 99 cents. Last night, I gave a quick update on my AdvoCare 24 Day Challenge so far in a Live video feed on my ASAP Workouts page. The Max Phase has me taking the MNS packs and also the Meal Replacement Shake, plus OmegaPlex too. I also took some Spark in the morning. If the 24 Day Challenge package is too much and out of your budget range, I suggest at least doing a 14 day trial run of the MNS series, and perhaps pairing that up with Spark. Today began with some initial measurements to see what the 10 day tally was from the Cleanse Phase of the 24 Day Challenge. I felt my weekend really hurt me with the diet, but I felt I got a little bit back on track. Overall, I went from 208 to 206, 18.3% to 17.9%. That's a body fat drop from 38 to 36.8 pounds, so I'll take it as a step in a good direction. Last night, I did a 30 minute ride on the bike and got 10 miles in, eating pretty light afterwards. I feel I need to add in more cardio in the evenings on the bike, or trying to run often at night, down at the gym. The Max Phase begins today for me, so I'm mainly taking the MNS packs, the Meal Replacement Shakes, and also OmegaPlex continues on as well for me. You can start the Cleanse Phase at any time, as the Cleanse Kit itself is sold as a package deal from AdvoCare. It's only 10 days and its pretty easy to do. There's an AM pack, a Fiber pack, and a PM pack to take. Order the Herbal Cleanse kit today, right here. Still thinking of the 24 Day Challenge? Check it out here as well. As I begin Day 9, I started with another round of Workout A from The Achievable Body. Mother Nature left me another quick workout afterwards to remove a couple inches of snow from the driveway. Workout A was sectioned off into 3 segments. 5 minutes of - 5 Goblet Jump Squats, 15 DB Bent Over Rows, 10 Squat Thrusts, 15 Arnold Presses, continually do this for as many rounds as you can in 5 minutes. My weights were pretty heavy on the Arnold Presses, so I just went to points of fatigue in the 10-12 rep range. After all this, I put on my winter gear to shovel some snow for about 15 minutes worth of shoveling. It's basically 2 days left of the Cleanse phase for me, today and tomorrow. The Max phase begins on Thursday for me. Yesterday went a little better for me on the diet, only one big meal at lunch time and things were pretty light in the evening. The Max Phase is pretty simple to do on your own with an MNS pack, paired up with Spark and also a Meal Replacement Shake (MRS) box of 14 servings. Every box of each item has 14 servings, which matches up greatly with a 2 week plan. Take a look here at http://tinyurl.com/asapadvo to read more about the MNS packs and the MRS's. Last night, I decided to ride my indoor bike for a half-hour workout of 10 miles on it. I kept my heart rate watch on to track that, my average rate was in the upper 120's and I kept it pretty steady overall for a nice and easy workout. This morning called for some more kettlebell cleans, so I went back to the 53# one, doing 10 reps/side x 4 rounds of that (40 reps), every 3 minutes, up to 18 minutes total for 240 reps of the workout. The KettleShield wrist bands I got work great at absorbing the impact of the kettlebell against the forearm on those high rep sets. They are a really great investment if you plan to do a lot of kettlebell ballistic lifts, like cleans, clean & presses, clean & jerks, plus snatches. My diet really struggles on a weekend, I've noticed. Just a lot of time to watch TV and usually eat something. I tried taking a nap in the afternoon on Sunday, and the bike ride later helped me a bit. I had a shake after the ride and that did help some cravings in the evening. My plans are to get the diet in check over the new week. I have 3 days left of the Cleanse phase and want it to end well. After a restful Day 6, I hit Day 7 wit another TAB workout, Workout D from the series, plus some kettlebell ballistics at the end. Workout D calls for a mix of exercises done in a circuit, then doing as many circuits as you can within 16 minutes, the "Sweet 16" routine. After doing multiple rounds of that (honestly, I lost track, but I'm guessing 6-7 times), I finished it off with a set of 100 straight KB Clean & Presses, done with a 40# KB and 5 reps per side, alternating arms every 5 reps on the way to 100. This took me just past 7 minutes total, right around 7:10 for time. I may get on the bike later today and give an indoor ride a shot. For some weekend viewing, if you weren't able to catch my Online Mixer, you can watch it any time on my ASAP Workouts Facebook page. Here's the first video as my general intro and coverage of the 24 Day Challenge. The second video covers more products and a little on the business opportunity. The third one goes through the catalog and talks a bit more about the product lines. Finally, my fourth video goes more into the business opportunity that AdvoCare provides, and why I chose to do it along with my blogs and affiliate products I sell. If you're like me, you'd like to earn extra income. But, time is a struggle. I tried doing my FT job from 8 to 4:30, then starting a job at 5pm and working until 9. It's a 13 hour stretch with an hour of break times to basically eat and rest before your next round of 4 hours of work. It isn't a great long term solution. I had to stop it for my health reasons, it was too much stress mentally to bear. The nice thing with AdvoCare is that your website can sell products for you, 24/7. Your opportunity is always there. There's no time clock, you're always punched-in with the opportunity. It is also a very low-cost option as well when you are a Distributor. It's $59.95 to become one, which is $5/month spread-out. $5/month to have to opportunity to earn income is a small investment, really! I've tried another company where it was $15/month AND I had to earn 'points' in order to keep my opportunity alive, month to month. That left me very frustrated, especially when I couldn't make a sale for months. Even if I made a sale on a $60 product, my commission would only have me breaking even for the month. It felt like a money trap, and I needed to get out of it. AdvoCare doesn't do that to me or to you. It is a great and trustworthy product line and its why I choose to sell it and help others out with it. I don't feel trapped by it, there is more freedom with it. I use some free time in the mornings and also at night to help others discover more about the lineup. That works great for me, and I can help you out so that it works for you, too. Ask me about it over my Facebook page. As a part of Day 6, I'm at least taking a break from an early morning workout. I may do one later in the day or this evening. Or perhaps I'll just do nothing and totally rest. Yesterday's diet hit a snag during part of the day. My lunch wasn't exactly a healthy choice, but that's to be expected when your ideal plan changes unexpectedly. I ate quite a bit less in the evening to try and balance my overindulgence at lunch. Today should be easier to plan and balance my diets out. Overall this week, the workouts have been going very well. The Achievable Body's workouts have lined up well with my times I have available to do them, plus the kettlebell clean routine that I'm doing on days in-between is really finding a good groove. When deciding on what to do with a kettlebell routine, I had a choice between KB swings or cleans to try with my heaviest kettlebell. I thought of doing just Swings alone as the workout, but I opted for cleans because of the upper body being used more in it, and my core being called upon throughout the exercise itself. You have to produce the force to drive it up, and also absorb the catch of it in the rack position up top. I know snatches are perhaps the most demanding, but I wouldn't be using my heaviest kettlebell for that exercise with multiple reps. I feel the cleans will develop some great endurance so I'll be able to handle snatches with the 53# one down the road this year. "Just Swing It!" is my most popular and best-selling Kindle guide of all time. A 30 day challenge is also something that can blend in well with the 24 Day Challenge from AdvoCare. If you have thought of the 24DC and want to take the action to get started on it, go here to choose your options and start the 24DC very soon! This morning called for Aggression Workout C from TAB, about a 22 minute routine. It started with a superset of split squats and dumbbell rows for 3 rounds, a minute rest between rounds. Then it hit a triple set of eccentric DB presses (I replaced it with pushups done on dumbbell handles with the same eccentric focus), followed by Romanian Deadlifts and then stability ball rollouts. 1 minute rest between each round of that for 3 rounds total. The Finisher to it was modified burpess (no push-up or jump), followed by triple-stop push-ups. You started with 8, then counted down to 1 each. That was a pretty good, all-around total body workout, once again provided by The Achievable Body. The diet is going okay for the 10 day cleanse. I did break down and get a pop yesterday, but it was a no-calorie one as my bargaining reason for having one. It didn't seem to affect me a whole lot, really. This weekend looks to be another solid one for working out, I will more than likely do a cardio workout to take it a bit easy, since I've had a lot of successive days of workouts. It's a short blog post today, so have a great weekend and keep moving forward into 2017! This morning called for a Kettlebell Clean workout with the 53# kettlebell, doing 2 sets of 10 per side for every 3 minutes, for 6 rounds total. After handling 40 every 3 minutes in previous workouts, I decided to try it for the entire workout in that format. It took me about 1:40 to do, with 1:20 to rest in-between. Overall, it was 240 instead of the usual 200 reps per workout. This is a better rate than when I started, doing 20 every 2 minutes and only getting 200 in 20 minutes of time. Today's workout was 240 in under 18 minutes, technically 16:40. This is Day 4 of the 24 Day Challenge and it is still going well. I talked about it last night during my ASAP Workouts Online Mixer, where I showcased a lot of the products with AdvoCare on my brief live videos. Finally, my last video covered more of the business opportunity that AdvoCare also offers. If you are looking for an inexpensive, flexible and online/offline business to run, AdvoCare provides that. My Online Mixer offer still stands: If you order any AdvoCare product, or become a Preferred Customer, you will be entered into a drawing for a free product from me! You have until today, Thursday, at 7pm Central time. Check out my AdvoCare site to see the products and order what you need! Let me know if you have any questions, email me at rkarboviak@Hotmail.com for specific questions, or through the ASAP Workouts page as well. Well, Day 3 today started off with The Achievable Body's Workout B from their series. It was a good round of box jumps, rows, squats, pushups, KB swings and side hops as a mini-circuit, doing the mini circuit 4 times total in about 17 minutes of time. TAB's workouts are close in duration to HWR's, so I'm planning to stick with all 4 (A, B, C, and D) throughout the 24 day period. I stuck pretty well to the plan but ended up enjoying too much salsa and light chips. It is a multi-grain, low fat chip that I found and my appetite got a hold of me. Tonight, I'm going LIVE with an Online Mixer to showcase some AdvoCare products and also have a special deal for you. If you order a product during the Mixer, you'll be entered into a drawing for a free product that I'll give away at the end! Join me from 7pm-9pm tonight online through this special Facebook Event page. What if you can't join? That's fine, you can still order a product today, or even join as a Preferred Customer, and be entered into my drawing. Not everyone is free at this time, I understand that. However, you can catch the videos later and still be a part of this fun event. Well, the weather brought some more snow and even a delay at work, so I went out and shoveled the snow from my driveway right away, and came in to get in a good workout with some KB Cleans. The snow was light and I was glad that I went out yesterday morning and removed the first round of it. Wind chills are close to -20, so I was glad it only took about 15 minutes to complete all my shoveling. Once that was done, I was able to use my new KettleShields, they are a special wristband with a plate inside them to help absorb the impact of kettlebells on your forearm. I used them last Saturday, after they came in the mail on Saturday. Very helpful and less stressful on the forearms for sure. I used the 53# kettlebell, doing sets of 20 every 90 seconds, then I tried 2 sets of 40 every 3 minutes, with 20 to finish on the last set for 200 reps total in under 15 minutes. I think over some time, I will get 40 every 3 minutes, x 5 rounds of that. The first day of the 24 Day Challenge from AdvoCare went well, It was pretty easy to follow along to it. I just noticed that AdvoCare has put the CU24 Level 1 workouts for free on YouTube. I may give those a try in the evenings. You can view them right here on this page. I won't do them every evening, but I've been curious about them in the product catalog and website, so this is a good way to try them out and decide if you want to get a hard copy on DVD for future use. I am putting on my ASAP Workouts Online Mixer on Wednesday night this week, from 7pm to 9pm. How does the Online Mixer work? I'll be going live through the events page and showcasing some products throughout the time frame. If anyone orders an item from my AdvoCare page, you will be entered into a drawing to win a free product from me! It is a fun way to learn more about AdvoCare from the comforts of home. Join me tomorrow night and show your interest here on the Facebook Events page for it! Today is the start of my AdvoCare 24 Day Challenge, the "All-In 2017" Challenge. It runs from today through Jan 25th. The Challenge starts in a 10 Day Cleanse phase, then a 14 Day Max phase. The 10 Day Cleanse has some probiotics, a fiber pack, and another evening pack to take, along with OmegaPlex. The 14 Day Max phase has meal replacement shakes, the MNS packs to take, as well as a few other things, such as Spark. Spark can also be taken during the Cleanse phase, too. There are other add-ons that people can get, but I just went with the basic overall package for my Challenge. The workout that I'm going with is the one from The Achievable Body program from Mike Whitfield. There are 4 main workouts he has, Workouts A, B, C and D to do. I will try to do one of these workouts, every other day, getting 4 workouts every 8 days, this would bring me through 3 cycles of those workouts over 24 days. Sounds good in theory, so we will see how it goes. Each workout is about 20-25 minutes to do. If I don't feel up to a full workout, I may do a briefer workout like a 10-12 minute one from HWR. I did try some running again last night, going for 2.5 miles in just under 20 minutes. I didn't have any Achilles tendon issues, and it really felt good to do and start off the year with a good run. If you feel you are too late to the Challenge, have no fear: I'm putting on another timeline in the month of January, starting January 9th, if you want to do the Challenge. Purchase the 24 Day Challenge package from AdvoCare, or if that is out of your budget, consider using the MNS series combined with Spark for the final 14 days of it. Or, simply buy 2 boxes of MNS (3, C, or E) and use it for 28 straight days. You'll still have time to order this week and get it in time before the 9th. I also highly suggest using either HWR or TAB along with this Challenge. Both offer some simple, follow along workouts to do, right at home. TAB also has some great diet plans to follow if you are looking for some structure there as well. I'll be looking at having an 'online mixer' this week to showcase some of these items. The Online ASAP Workouts Mixer will be like a little party on Facebook, where I'll showcase some items and whoever orders an item over the course of the party will be entered into a drawing for obtaining a free combination of products from AdvoCare! It is something new to try and is pretty easy for me to do from home, and for you to watch from home as well. Look for me to post it later today on my Facebook Page for ASAP Workouts.